On April 14th, 2018 Earthshed Solutions held its third PermaBlitz at a rural property in Paradise. The ‘Blitz Hosts, as part of their goal for the property, wanted additional raised beds so they could increase the amount of food they produced. Ahead of the ‘Blitz the Hosts constructed two raised beds to match existing beds on site. One method recommended to the Host, was to use resources on site to fill the 24” high beds. This style of bed is called a lasagna bed. Like the lasagna you eat, it is filled with layers, but instead of noodles, vegetable/meat sauce and cheese, it is filled with layers of brown (carbon) and green (nitrogen) organic materials. The empty beds were first filled with wood, twigs and leaves from the owner’s property. This was the first carbon layer. Carbonaceous materials are things like: straw, cardboard, newspaper, wood chips, shredded paper, leaves, corn stalks, etc. These materials generally have a Carbon to Nitrogen (C:N) ratio of over 60:1. Examples are (all are approximate): leaves are 60:1 while certain wood chips are 500:1. Next, came a layer of nitrogen material: bunny poo, grass clippings, fava bean plants, and coffee grounds. The bed filled with nitrogen materials: bunny poo, grass clipping and fava beans plants and coffee grounds. Not all “greens” are the color green. Some, like manures and coffee grounds, are brown or black. Other nitrogen sources are: feathers, hair/fur, actual green plant material, alfalfa, spent brewery grain, fruit and vegetable waste from the kitchen, etc. The carbon to nitrogen ratio of a green is less than 60:1. Examples are: urine, which is 1:1 while horse manure is approximately 30:1. Water was applied between each layer to help fill any holes and wet the material. Applying water is important to ensure biological activity begins to take place in the layers. The cycle was then repeated: brown layers approximately 3-4” thick then a green layer approximately 1” thick. 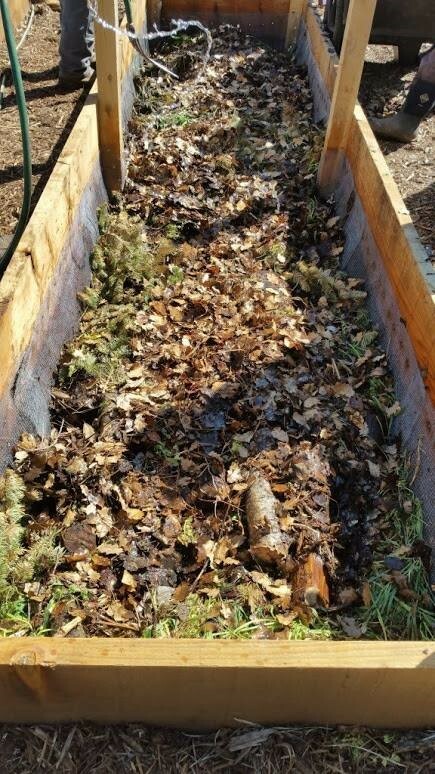 The final layer on top was 12” of soil – a mix of good garden soil and mushroom compost which was then topped with straw to protect the soil until it was ready to be planted. There are many methods to creating a lasagna garden. 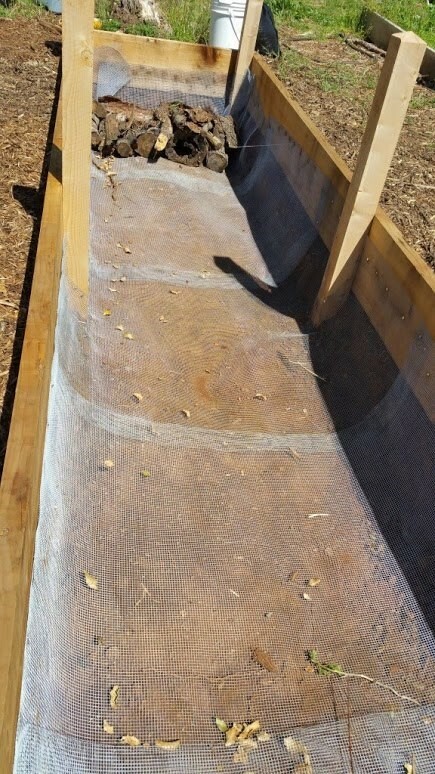 For the Host’s purpose, these beds used materials on-site so they weren’t hauling anything to the landfill or buying anything other than the mushroom compost. And in approximately two years, most of the material placed in the beds will decompose down to rich, wonderful soil. 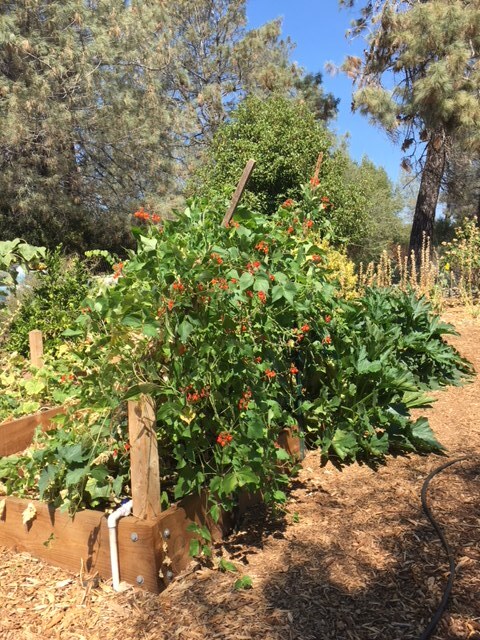 Here is what one of the lasagna beds look like in September, 5 months later! 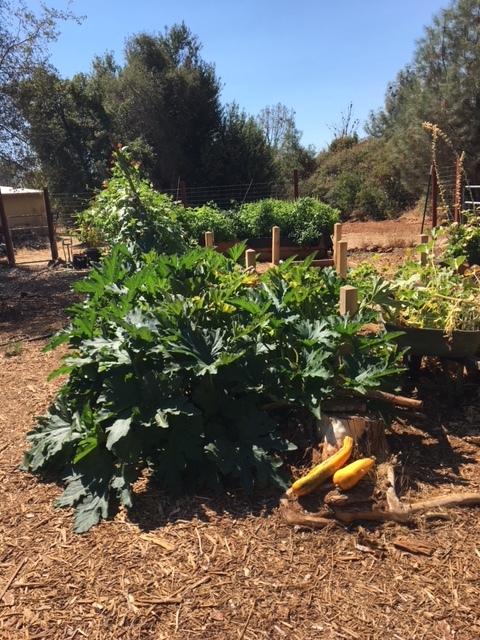 Obtain a Yield: Two more raised beds = more food on the table. Food can account for a substantial amount of our ecological footprint, so it makes sense to grow our own. Not only from a cost perspective of buying organic produce at the store, but knowing the food is pesticide free, grown in healthy soil and is nutrient dense. Another yield from the PermaBlitz was the yield of building community: 30 people working hard and learning = priceless! local bio-region ensuring we are valuing our renewable resources. At this ‘Blitz we will be doing many more projects and activities which apply the permaculture principles in several ways. Learn more in our previous blog post or click here for details on how to RSVP!